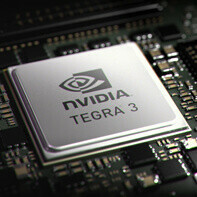 The Tegra 3 SoC by NVIDIA can be found under the hood of many Android smartphones and tablets. Even a video game console – the Ouya, which got Kickstarted not long ago, is powered by this potent quad-core piece of silicon. 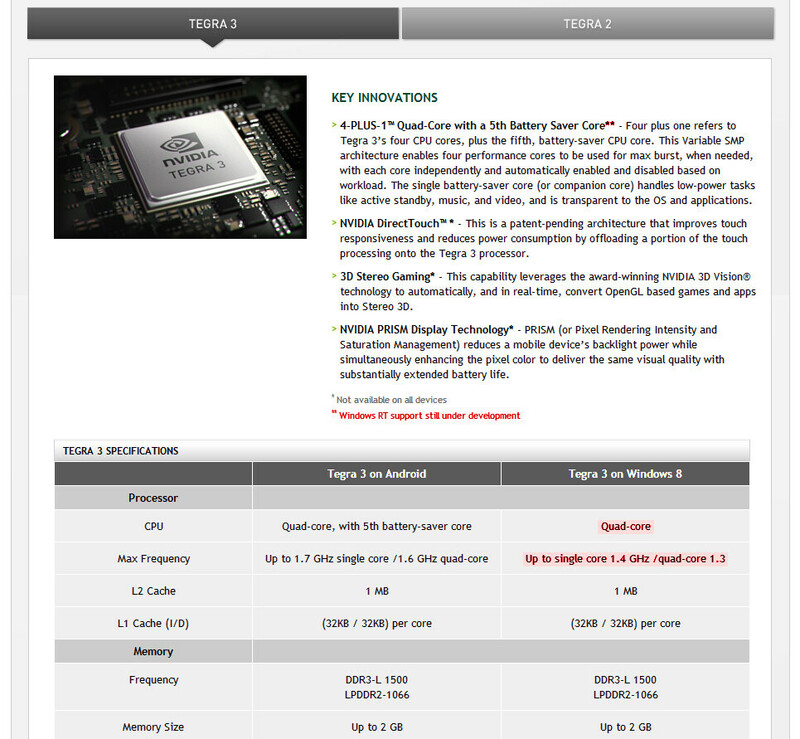 Microsoft also chose a Tegra 3 chip to be the heart and brains of its Windows RT Surface tablet. However, the Microsoft Surface is just not making the most of its Tegra 3 processor, and the device's hardware is not to blame. Rather, we're dealing with a lack of software optimization, judging by the looks of it. In particular, it is stated on NVIDIA's web page that Windows RT still does not know how to distribute the workload efficiently between the SoC's four performance cores and the fifth, battery-saving core. Besides, while the Tegra 3 can be clocked at up to 1.7GHz on Android devices, the maximum clock frequency that can be reached with Windows RT is 1.4GHz. Perhaps that is one of the reasons why we noticed a few performance issues while doing our Microsoft Surface RT review. Perhaps that's also why HP found the tablet a bit slow and kludgey. Still, we are pretty confident that Microsoft will sort this out soon. As it is said on NVIDIA's page, full Windows RT support for all of Tegra 3's advanced features is still under development, meaning that the issue will most likely be addressed in a future software update. Until then, you are free to distract yourself with a game of Minesweeper. First of all Microsoft Surface RT is less powerful than it's main rivals, then this issue. Microsoft it's just not getting it. They had so much time to develop Windows RT but they are still lagging behind. let me make correction to your statement "surface RT is slow because it is not fully optimized for tegra 3, when it will be fully optimized, it will work faster"
MS will have big troubles as they don't allow OEMs to modify the OS, for PC that's OK b-c they have monopoly. But in mobile when your OS is not optimized you just can't compete. i do not think so. windows phone is spreading its claws.... android is going fast but wp is going up, too. Let me make the correction to your statement. Microsoft is a multi-billion dollar company, the surface should have been optimized for windows rt out of the box. There is no excuse for that. I hope the surface pro comes out soon with less problems. It only confirm WP beta tester status. Worrrdddd uppppp. LOL me too! I wish we could have gotten that in the Surface Tablet. I hope they consider ATI for the Surface 2. Well word is amd is going mobile very soon, so lets just wait and see. hoping to see surface HD RT or surface 2 RT with a la retina display and with tegra 4(cortex a15...but hoping that new cortex a57!!!) that would be the best tablet PC ever! that would kill android tablet! even though they dont have that big share! this is information is just what I expected was the cause of the reports I read about the Microsoft Surface being slow and laggy. The Windows RT OS for tablet computer's is Microsoft's first try at an OS using Arms chip's on a tablet. it took Google's Android programmers awhile to get to Ice cream sandwich and Jelly bean Android updates to get Android Tablet computers to run smoothly. Microsoft Tablet computer Programmers are now cutting their teeth learning to deal with ARMS CPU chipsets. The 2013 Surface RT will probably run very smoothly but current Surface RT Tablet Computers will get update after updates in their software till Microsoft programmers get it right. Microsoft has just announced that they would support their surface RT computers for 4 years this means that People who have already bought a Surface RT computers over time will get the updates to make it run more smoothly and will get lots of new apps because developers now know that the Microsoft RT computers will be around for years to come making it worth their efforts to make Apps for Surface RT tablet computers and Microsoft OEM partners Window RT Tablet computers.